Last winter I created a Hot Chocolate Bar for the kids and needless to say, the kids were amazed by it (and still talk about it). One snow day during winter, as the kids sipped hot chocolate, they requested to do a hot chocolate party this summer. I don't know about you, but I can't stand to drink hot chocolate when temps are in the 80's. Instead, I put a summery twist on a favorite and created a Frozen Hot Chocolate Party. I started by making the hot chocolate the night before and letting it freeze overnight. I used our favorite Mexican hot chocolate recipe (the same recipe that I used for our Hot Chocolate Party). I made it and then cooled it off completely, stirring it every 10-20 minutes as it was cooling so the chocolate stayed smooth and not clumpy. Once it was completely cooled, I poured it into clear plastic cups. I put it into the freezer overnight and took it out 30 minutes before drinking so it was more slushy. The kids used slushy straws so it was absolutely perfect; they could drink it or spoon it up! The kids LOVE topping their hot chocolates with everything from whipped cream to candies to sprinkles. The big surprise of the day came at the end of the party when the kids got to swim in a CHOCOLATE POOL! 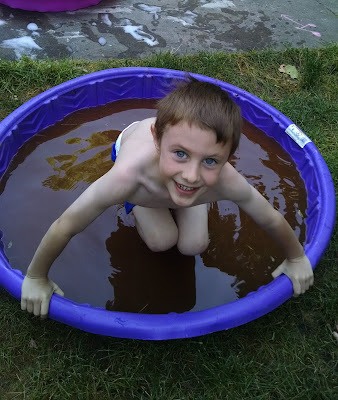 The chocolate pool was simple (and not completely chocolate). It was water with a good amount of Hershey's cocoa powder in it. It had to be stirred a while so it wasn't clumpy (I put the big kids in charge of that task), but it smelled really good! A few of the kids tried a drink of it but mostly they just enjoyed hopping into the chocolate and rinsing themselves off in the bubble pool. Please note: the chocolate will leave swimming suites/swim diapers/etc. with chocolate residue but it will wash out! I had a panicked when I changed a swim diaper and noticed the outside was completely brown. I thought I had missed a poop, but it was just the chocolate absorbing into the diaper! The toppings included: sprinkler, chocolate chips, red, white and blue M & M's, big and small marshmallows, and chocolate and regular whipped cream. This was a great summery twist on a favorite classic! The kids have requested "to do more bars" because they like all of the choices they have....plus, who can say no to anything chocolate? ?